It took you FOREVER to find that perfect holiday gift for your wife, husband, girlfriend, boyfriend ... You're pretty proud of yourself, but don't rest on your laurels yet. Valentine's Day is right around the corner. Maybe a proposal is in the works, or you want to make up for that gift that didn't make it under the tree. Don't panic! The vendors at Good Ju Ju have got you covered. We've assumed the role of your very own personal shopper and come up with some fantastic ideas to make your special someone VERY happy. You can't go wrong with spelling it out, and nothing says love better than the word ... LOVE. Put it in a window or accented with some primitive materials. Both are available in the store and can be custom-ordered as well. 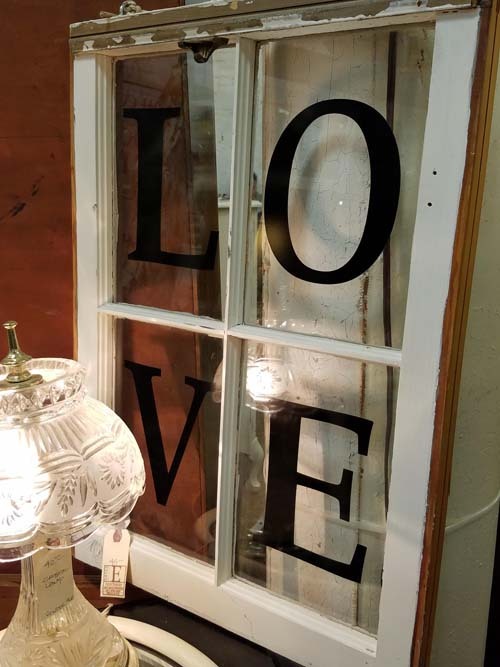 Visit JoLynn & Therese from Eclectables or Kathy at Junkie for some LOVE-inspired treasures. Needing the perfect gift for a more traditional someone? Glass Cat Vintage has a few items sure to please. How about an authentic cherub cast-iron doorstop? Or maybe a Fenton hobnail milk glass epergne? Or you can go all out with some gorgeous Lalique stemware. You'll score major brownie points! Looking for unique jewelry? Then look no further than Dianne at D-R Designs Jewelry. Shop her wide selection of already-made items or consult with her on that one-of-a-kind piece. Dianne has used clients' existing jewelry and watches to fashion beautiful, one-of-a-kind treasures. And let's not forget the guys. 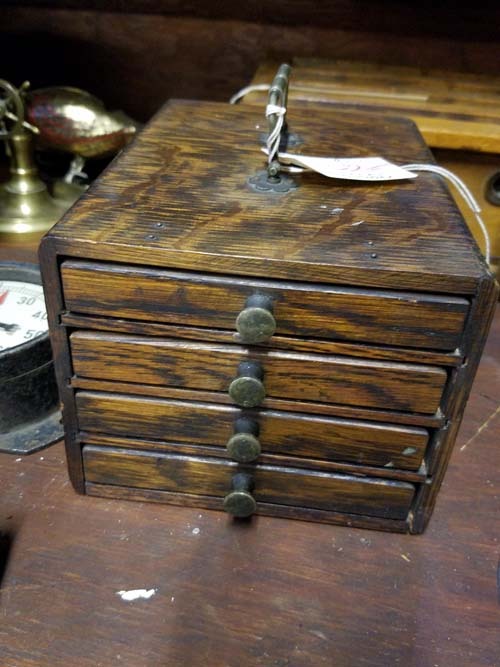 If he's a collector or needs that special something for the Man Cave, check out Chris at Eclectibles Antiques. 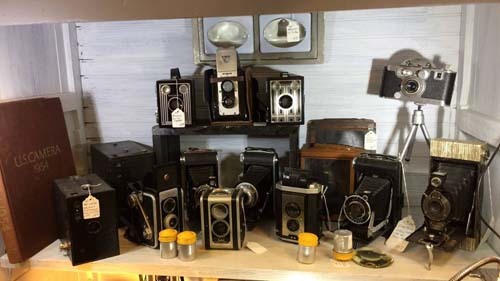 He has a wide variety of vintage cameras, sports ephemera and antique baseball gloves sure to please the "boy in your life" who needs more toys. Who says Valentine's Day gifts have to come in small boxes? 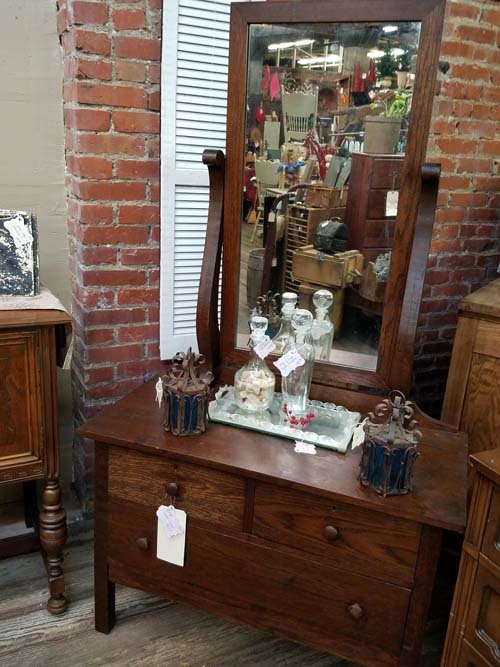 A beautiful piece of antique or vintage furniture makes a great present. Good Ju Ju is not all painted furniture -- there are lovingly restored original finish pieces on all floors. Wrapping optional. If the above haven't hit the spot, scroll through the pictures below for more ideas. Bottom line -- Valentine's Day presents don't have to be traditional. 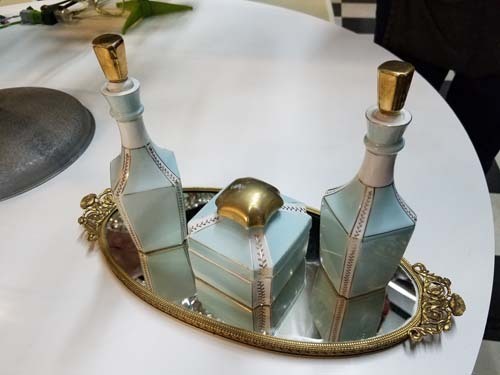 Think outside the box and eschew the typical gifts of flowers, candy or jewelry. Your special someone will know you put some thought into it, were thinking about them, and that's what's really important, isn't it? And if you really can't decide, it doesn't hurt to give a Good Ju Ju gift certificate. They are available at checkout during the First Friday sales or by calling the store between sales. A special day of shopping at Ju Ju followed by a lovely meal can be a wonderful gift as well. Kansas City's West Bottoms Shopping District: The Next National Antique and Vintage Shopping Sensation?